The thousand year old temples of Angkor lie peacefully, in a lush grassy wooded area, just 20 minutes drive from the Golden Temple Hotel. The UNESCO-protected ruins of Angkor Wat, is the centre piece of the once-mighty Khmer empire which covered a vast 400 square metre area. 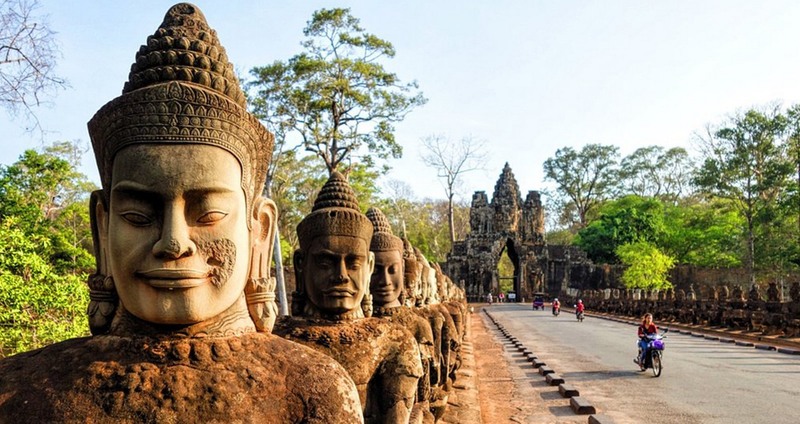 Although there are more than 150 significant temples in the area, guests normally explore Angkor Wat temple plus the temples of Bayon and Ta Phrom. 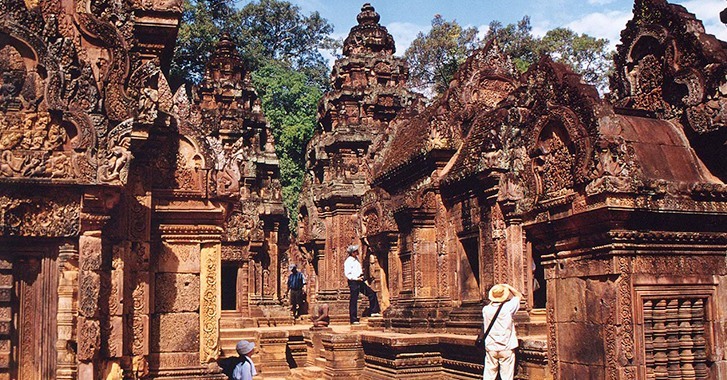 Other temples worth a visit include Banteay Srei,and the temple group at Roluos. Guests may enjoy a leisurely sail around the moat of Angkor Wat aboard an Angkorean battle boat, known as Kongkear Angkor. 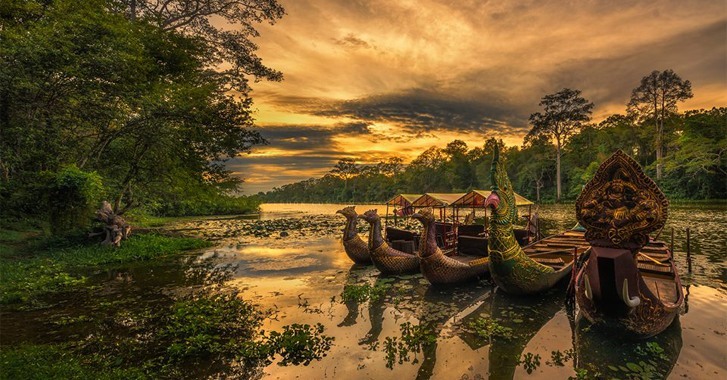 In 1177AD, boats of this type won a great battle on the Tonle Sap river, not far from Phnom Krom, the acknowledged entrance to the Khmer empire. Angkor Wat or Capital Temple is the temple complex located just eight km from downtown Siem Reap, Cambodia. It is the largest religious monument in the world and a UNESCO-protected site. The Angkor park is home of the god Vishnu, represented on earth by the Angkorean king. 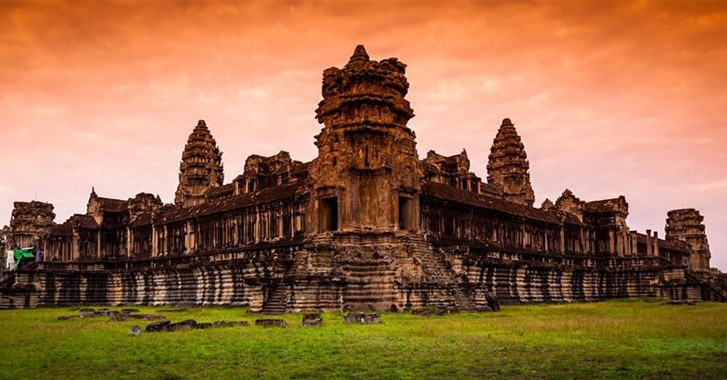 The initial design and construction of the temple took place in the first half of the 12th century, during the reign of Suryavarman II who ruled from the 1113 to 1150. Dedicated to Vishnu, it was built as the king’s state temple in the centre of his capital city. Towards the end of the 12th century, Angkor Wat gradually transformed from a Hindu centre of worship to Buddhism, which continues to the present day. Banteay Srei meaning “Citadel of the Women” is dedicated to the Hindu god, Shiva. Located 30 km from Angkor Wat it is well worth the extra traveling time. Built in the late 10th century, the beauty of the carvings on pink stone are still clearly visible. Banteay Srei is built largely of a hard red sandstone that is relatively soft and can be carved like wood. Brick and laterite were used only for the enclosure walls and some structural elements. The temple is known for the beauty of its sandstone lintels and pediments. Kongkear Angkor is a traditional naval boat. A fleet of these boats are available for hire. But there’s no naval battles today. Nowadays guests lie back, sip champagne, enjoy canapes, watch the sunset and take photos while the guide navigates the waterways where history, nature and culture come alive. Please let us know of any special requests that you may have by clicking the button below. Siem Reap Kingdom of Cambodia.